An asteroid heading for Earth will cause destruction of biblical proportions, change the climate of the globe and devastate human life, scientists say – but not until 2880. The 1950 DA asteroid measures one kilometre in diameter and is travelling at nine miles a second relative to Earth – meaning it will hit the planet at 38,000 miles per hour. 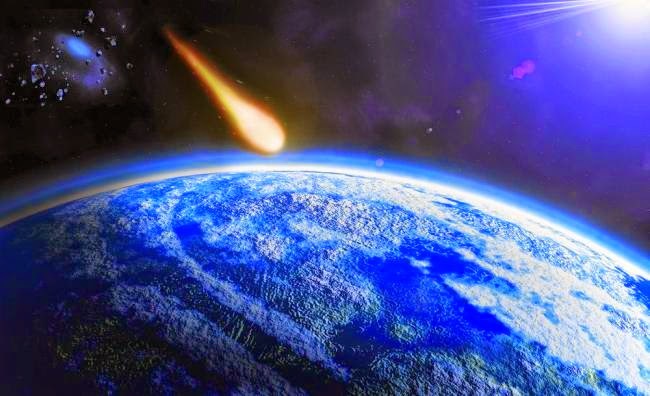 However, although the likelihood of the rock hitting the Earth is relatively high in asteroid terms at 300/1, scientists are confident that, with 35 generations to go until its arrival, the disaster can be averted. And scientists say that appreciation for the field has grown since an undetected meteor injured 1,500 people in a Russian city last year. ‘Following the February 2013 asteroid impact in Chelyabinsk, Russia, there is renewed interest in figuring out how to deal with the potential hazard of an asteroid impact,’ University of Tennessee postdoctoral researcher Ben Rozitis told The Independent. Another interest in this particular asteroid stems from its high-speed rotation that is so quick it ‘defies gravity’ and stops it from breaking apart. ‘Understanding what holds these asteroids together can inform strategies to guard against future impacts,’ Mr Rozitis added.